Glendale City Hall is located at 5850 West Glendale Avenue, Glendale AZ 85301; phone: 623-930-2252. Photo: Phillip Marshall House, ca. 1930, North 58th Drive, Catlin Court Historic District, Glendale, AZ The Historic District was listed on the National Register of Historic Places in 1992. Photographed by User:Marine 69-71 (own work), 2012, [cc-by-3.0 (creativecommons.org/licenses/by/3.0)], via Wikimedia Commons, accessed February, 2014. Construction of the Arizona Canal enabled agricultural development northwest of Phoenix. Desert Lands Act of 1879 opened irrigable lands in the Salt River Valley to homesteading. Promotional efforts of Phoenix capitalist and land developer W. J. Murphy. "Colonization" of Glendale/Peoria area with ranches by settlers from around Chicago. Construction of Grand Avenue in 1888 from Phoenix to Peoria (through Glendale site). Establishment of the "Temperance Colony of Glendale" by B. A. Hadsell and members of the Church of the Brethren from Illinois. Plating of the Glendale Town site in November 1892. Completion of the Santa Fe, Prescott and Phoenix Railway in 1895 through Glendale. Flood of 1895 followed by three years of drought devastated Glendale farmers. Completion of Roosevelt Dam in 1910 assured a stable irrigation water supply. First building boom of housing and businesses for new agricultural workers. Town of Glendale incorporated 18 June 1910 with a population of 1,000. Extension to Glendale of Phoenix Street Railway System operated 1911-1928. Russian colonists arrived in 1911 to cultivate sugar beets. Catlin Court residential subdivision platted in 1915 as first cohesive neighborhood. Cotton boom during WW-I collapsed in postwar depression. 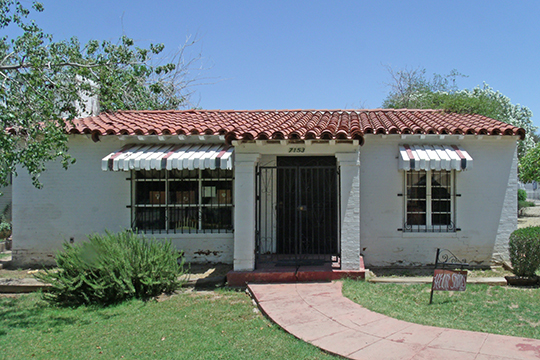 Effects of depression were most severe in Glendale in 1931-1933. New Deal programs help housing and farming. Thunderbird Field and Luke Field established by U.S. Army Air Corps in 1941. Aluminum defense plant established south of Glendale. American Institute of Foreign Trade established at former Thunderbird Field in 1946. Airmen and defense workers settle in Glendale after WW-II.